A mea culpa confession of a VBA feature which has been missing from my life for far too long! You can see that the title, prompt and default value for the input box have been set. InputBox A generic VBA function to get information from a user. Application.InputBox An Excel-specific souped-up version of the same function. The standard input box arguments. 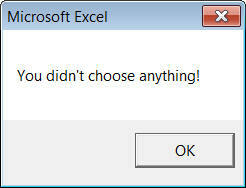 The biggest difference is that the Excel-specific input box has an extra Type argument. This definitely isn't a number! You won't be able to proceed until you either type in a valid number or press Cancel. The most useful arguments are likely to be 1 (to force a user to input a number) or 8 (for a range). MsgBox "You didn't choose anything!" You can now select a range of cells. Here we've gone for 6 cells at the top left of a worksheet. If you cancel out of the dialog box, the range variable won't be set and you'll get an error. And there endeth my confession! For those wanting a fuller picture, there's much more about Application.InputBox in my colleague Andrew's tutorial video on the subject.